At Mastodon Ridge you will find lots to do and explore! Children will enjoy playing outside on the jungle gym and slide. 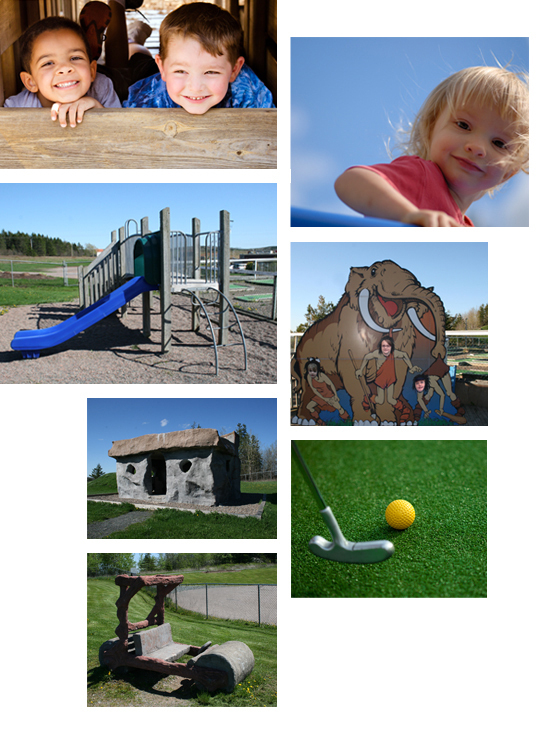 Along with our playground equipment we also provide a grassy play area located next to our Mastodon, complete with a fun prehistoric stone house and stone car. Please note all children under 15 must be accompanied by an adult. Visitors of all ages will enjoy our popular 18-hole mini putt course. It’s an activity the whole family can do together. Why not challenge yourself to a game of minigolf at Mastodon Ridge? With 18 holes of varying difficulty, it’s fun for everyone! Interested in having an event at Mastodon Ridge? We can coordinate an event for any age group in conjunction with KFC/Taco Bell, Tim Hortons, The Local Shop Ice Cream, Mastodon Ridge Mini Golf and Coldstream Clear Distillery.